In September 2012, Vladivostok will host a summit meeting of the Asia-Pacific Economic Forum (APEC). The region’s infrastructure has to be uprated for an event of this magnitude, and one of the projects now being implemented is the building of a hotel complex on the Russkiy Island. A for-lane motorway bridge is also being erected to link the island to the mainland. With a suspension tower height of 320 metres (20 metres taller than the Eiffel Tower’s steel construction) and a free span of 1104 metres, this bridge breaks two world records at once. Construction company Mostovik is responsible for on-time completion of the mainland tower. In order to have the world’s tallest A-shaped suspension tower completed on time by the beginning of 2012, Mostovik decided to go with a high-performance and reliable formwork solution from Doka. The decision was leveraged primarily by the wealth of experience that the formwork specialist has amassed over the last 50 years on infrastructure projects all over the world, and particularly on the build of the 306-metre A-shaped suspension towers of the Sutong Bridge in China. On the Vladivostok project, however, it was not just the geometry of the structure that challenges formwork planning to the utmost. The extremes of the geographic location with frequent stormy weather and bitter cold in the winter months were a major influencing factor on this build. Right from the start, Mostovik specified that compliance with a closely regulated and rapid timeline for progress on this build would take top priority. 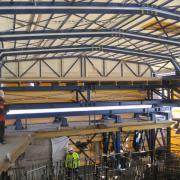 Doka planned a self-climbing formwork solution with 650 m² of made-to-measure Top 50 beam formwork. The finely jointed and highly adaptable SKE50 automatic climbing formwork was ideal inside the tower legs, where space was at a premium, and SKE100 with its high load-carrying capability was climbing the outside walls. Rated at 10 metric tons lifting capacity per bracket, it was ideally sized for craneless lifting of the beam formwork assemblies and seven different platform levels. The climbing falsework was anchored to the structure at all times, so craneless, safe lifting of formwork and platforms could proceed in virtually any weather. Extremely strict specifications for achieving optimum-strength concrete necessitated yet another formwork-engineering innovation. The CIP concrete had to set for four days in the closed formwork before stripping out could commence. 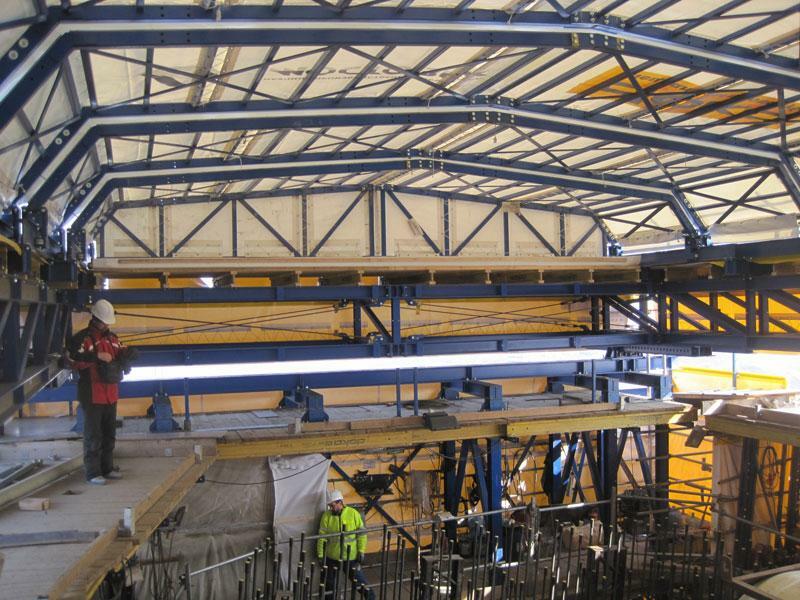 To ensure high-quality concrete placement even at extremely low temperatures, Doka enclosed all seven platform levels inside a robust scaffolding tarpaulin and built a roof consisting of seven sections. The workplace was fully enclosed inside this structure and could be heated in winter. When ambient temperatures rose and when reinforcing bars had to be manoeuvred into position, the individual sections of the roof slid one above the other on rollers. The high adaptability of SKE to different geometries and angles of inclination was another advantage on this project, because the cross-section of each tower leg tapers from 13 metres in the first concreting section to a mere 7.5 metres in section 71. Wall thickness too diminishes gradually from 2.0 metres to 0.75 metre. Adaptation in each concreting section is rapid and straightforward, thanks to telescopic platforms and reducible beam-formwork assemblies. Lead contractor Mostovik is impressed by the just-in-time delivery of the formwork solution, and especially delighted by the good on-site support. To ensure smooth progress in all the forming operations, two Doka site foremen and an engineer were on site all the time, providing virtually round-the-clock advice and assistance for the site crew. Time pressure was so high that the shifts were working day and night to complete the huge suspension tower in strict adherence to the one-week cycle planned in advance. This project was another example of how Doka customers all over the world can count on the consolidated know-how and professional support of the Doka parent company. Thank you for your interest - World’s tallest A-shaped pylon completed. Thank you very much for your interest - World’s tallest A-shaped pylon completed.